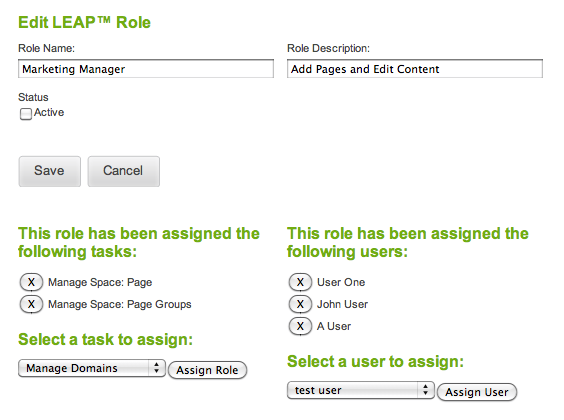 When a user logs into LEAP they are able to view and perform actions that are in their Role and Task permissions. Each LEAP™5 install can have customized roles to suit your organization - such as Web Admin (God level rights), Content Manager (just below God), and Content Admin (just edit the text within the page!). These names can be adjusted to suit. Tasks are the actions such as Adding Pages, Adding Menu Items, Accessing Premium functions such as E-Broadcast and HitMap. For example a Marketing Manager might have permission to Add Pages, but Marketing Admin might only be able to Edit Content within the page. You can see the number of users against each role, and the number of tasks each role has associated to it. Note: you can only delete a Role if there are no Tasks or Users assigned to it. 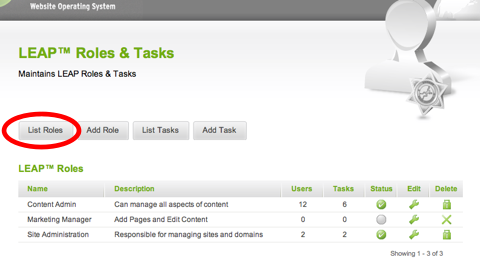 Assign tasks to roles by editing the role, and choosing from the pull-down menu of available tasks.